Apartment 1 is on the first floor. 80m² split into four rooms plus kitchen and rest room. We sanded the wooden floor and doors to keep the former aesthetics. 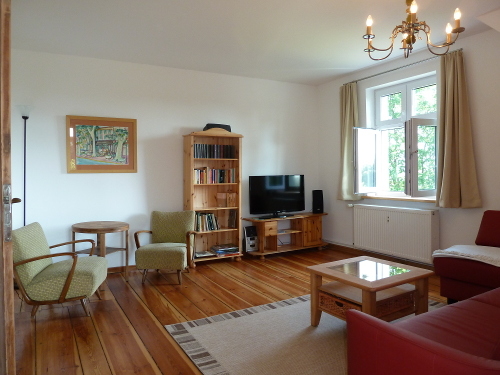 The tower room (7m²) offers probably the best view of Hohenlychen. Usually our guests like to enjoy the view while using it as the dining room. The living room (20m²) offers cozy seating options and is equipped with a sofa bed for 2 with a size of 160 x 200 cm and a TV. The Bedroom (20m²) offers Occupation for 2 on one bed (180 x 200cm) and a large cupboard. The white tile stove is no longer functional but decorative and can be used as a hat rack. 5m² and a bed offer occupation for mostly one person. The bathtub in our bathroom can be used for shower and taking a bath. Towels and a hairdryer are available. Four people can sit comfortably in the kitchen (10m²). It is equipped with: Refrigerator, fume hood, dishwasher, kettle, toaster, hob and oven. Unfortunately we cannot allow pets in our apartment. Smoking is unwanted as well.